Gateway Load Balancing Protocol (GLBP) is a Cisco proprietary protocol that attempts to overcome the limitations of existing redundant router protocols by adding basic load balancing functionality. In addition to being able to set priorities on different gateway routers, GLBP allows a weighting parameter to be set. Based on this weighting (compared to others in the same virtual router group), ARP requests will be answered with MAC addresses pointing to different routers. Thus, load balancing is not based on traffic load, but rather on the number of hosts that will use each gateway router. By default GLBP load balances in round-robin fashion. GLBP elects one AVG (Active Virtual Gateway) for each group. Other group members act as backup in case of AVG failure. In case there are more than two members, the second best AVG is placed in the Standby state and all other members are placed in the Listening state. This is monitored using hello and holdtime timers, which are 3 and 10 seconds by default. The elected AVG then assigns a virtual MAC address to each member of the GLBP group, including itself, thus enabling AVFs (Active Virtual Forwarders). Each AVF assumes responsibility for forwarding packets sent to its virtual MAC address. There could be up to four active AVFs at the same time. By default, GLBP routers use the local multicast address 224.0.0.102 to send hello packets to their peers every 3 seconds over UDP 3222 (source and destination). 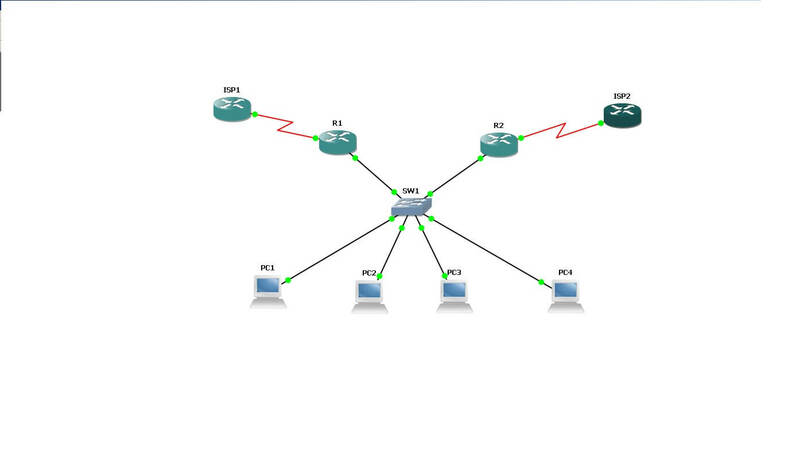 Lets now start with our topology. Here PC1,PC2,PC3 and PC4 routing is disabled with “no ip routing” and all are pointing towards the GLBP assigned address 10.0.0.254, which is assigned on the LAN interface of R1 and R2 pointing towards end hosts. Additionally R1(AS-12) is connected to ISP1(AS-501) and R2(AS-12) is connected to ISP2(502) . I have not configured R1 and R2 to be an IBGP neighbor, although R1 and R2 both receiving same routes from ISP1 and ISP2. PC1,PC2,PC3 and PC4 have addresses in range 10.0.0.0/24 and ip routing is disabled and default-gateway is configured to be 10.0.0.254(GLBP address) assigned on Fastethernet0/0 interface of R1 and R2. Now lets start with the verifications of GLBP. As we have not configured any fancy stuffs so far in GLBP , lets check the output of “show glbp” on R1 and R2 respectively. State is Standby —>>This is standby AVG as this has the lower ip address assigned similar to HSRP or VRRP. Preemption disabled —>>Preemption is disabled by default similar to HSRP, only VRRP has preepmtion enabled by default. Active is 10.0.0.102, priority 100 (expires in 7.136 sec) –>>This is pointing towards the Active Gateway that is R2. Standby is local —>>R1 is standby AVG. Priority 100 (default) —>>Default priority. Owner ID is c201.1550.0000 –>>AVF is R1, this is in listen state means this will answer the next ARP response. Owner ID is c200.1550.0000 —>>AVF is R2 and this is Active means this will answer the ARP. State is Active —>>This is AVG as this has the higher ip address assigned similar to HSRP or VRRP. Active is local —>> This indicated that this is AVG for this group. Priority 100 (default) —>>Priority of all FHRP’s by default is 100. Weighting 100 (default 100), thresholds: lower 1, upper 100 —>>Default config of GLBP. Load balancing: round-robin —>>Default load-balancing of GLBP. Owner ID is c201.1550.0000 —>>AVF is R2 and this is Active means this will answer the ARP. Owner ID is c200.1550.0000 —>>AVF is R1,this is in listen state means this will answer the next ARP response. So far so good, so we are doing some Load balancing out here, but really are we doing, how can we check.The easy way to check is from pinging from our end hosts Pc1 through Pc4 and see do we actually distributing the load, as seen in the above output. Internet 10.0.0.254 0 0007.b400.0101 ARPA FastEthernet0/0 —>>AVF is R2. Internet 10.0.0.254 0 0007.b400.0102 ARPA FastEthernet0/0 —>>AVF is R1. So the output is quite promising we have sent twenty packets as a whole towards our destinations and 10 packets are routed via R1 and 10 packets are routed via R2. As the default Load Balancing in GLBP is round-robin as we have seen in the output of “show glbp” it means the forwarding engine inside the GLBP will serve packets one after another in a round robin fashion. As evident from the output. Now lets modify some of the outputs,Here our connections to ISP1 and ISP2 are both T1 means (BW 1544 Kbit), now lets say the connection to ISP1 from R1 is DS3 channel(45 Mbps), and now we want packets are more likely to be forwarded towards R1 in comparison to R2.Lets modify the weighting and watch the results. For actually test the load-balancing we need to create an extended access-list on R1 and R2, that we can use for packet counters, and ping from our end hosts PC1 through PC4, and change configurations on R1 accordingly as this the faster link so i have increased weighting of R1 as double than R2 and decreased the Forwarder preempt delay from Default 30 seconds to 1 second on R1.So the final config on R1 is. glbp 1 weighting 210 lower 195 upper 205 —>>This side weighting is twice than R1(100 default). glbp 1 load-balancing weighted —>>This will change the default LB from Round-Robin to Weighted. glbp 1 forwarder preempt delay minimum 1 —>>The forwarder preemtion delay is minimum to 1 sec. The access-list 100 is used as packet counter and applied inbound on R1 and R2, the config is below. Now lets start pinging from PC1 through PC4 with repeat count of 1000 each. Now lets see the result on R1 and R2 by using access-list that we have made for packet counters. Voila, the results are quite good as we can see total 4000 packets sent out of which 3000 packets are forwarded by R1 and 1000 packets are forwarded by R2. Its really hard to simulate actual load-balancing in GLBP, also if we can refer to Cisco DOC-CD GLBP the load balancing algorithm is not well documented here. We can configure authentication and tracking, same as we use in HSRP and VRRP, the configurations are almost same only we need to replace key word glbp in GLBP by standby in HSRP or vrrp in VRRP, rest are same. Good resources to look for GLBP.